Negotiations over new labour contracts between Norway’s national employers’ organization NHO and the two large trade union federations LO and YS broke down on Thursday. Now it’s up to the national mediator to avoid a major strike in the private sector. Both Gabrielsen and NHO boss Kristin Skogen Lund described the negotiating climate so far as “good.” Now they face a new deadline for mediation of midnight on April 7 to avoid a strike that would begin April 8 and could pull as many as 235,000 private sector workers off the job in a variety of businesses around the country. It would be the first storstreik (major, national strike) in 18 years. The major nagging issue involves terms for early retirement at age 62 (the official retirement age in Norway is 67). Both sides agree there are flaws in the current system of agreements for early retirement that should be corrected. While LO only wants some adjustments and “to fill some holes,” NHO is demanding a major overhaul of retirement clauses in collective bargaining agreements. The negotiations have been further complicated by an agreement struck earlier this year involving early retirement provisions for public sector workers. NHO thinks it’s much too expensive and generous and has led to “unrealistic” expectations in the private sector. NHO has also argued that early retirement programs are under-financed and no longer sustainable, a claim LO strongly denies. NHO wants to make early retirement funding more earnings-oriented as well, while LO fears that will put all the risk tied to returns on retirement savings on the employee. While the two sides are thus far apart on the pension issue, there also are conflicts over pay and new rules for travel, room and board that’s expected to be paid by employers. The labour organizations claim companies are trying to avoid covering employee expenses when they’re sent out on various assignments. The unions also want “real pay raises” this year that will boost purchasing power, after several years of accepting only moderate increases that barely meet inflation. The negotiations over pay and pensions have sparked articles outlining the differences, meanwhile, between those earned by officials of NHO and the trade union federations. 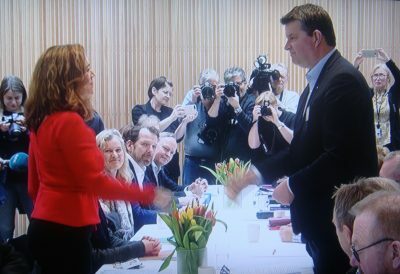 Newspaper Dagsavisen reported that while NHO boss Lund earns NOK 3.65 million a year, plus NOK 627,000 paid into her own pension account, Gabrielsen of LO earns less half than that, with his salary set at NOK 1.29 million and an annual pension contribution of NOK 289,000.